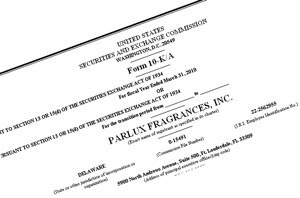 Perfumania Holdings, Inc. (Nasdaq:PERF - News) and Parlux Fragrances, Inc. (Nasdaq:PARL - News) announced today that they have signed a definitive merger agreement under which Perfumania would acquire all of the outstanding shares of Parlux in a transaction valued at approximately $170 million, based on Perfumania’s closing stock price of $19.55 per share on December 22, 2011. And how is PERF going to swing the transaction? The company said it will finance the cash portion of the acquisition by borrowing up to $43 million against its secured credit line and $30 million from family trusts of the Nussdorf family. Members of the Nussdorf family own about 82 percent of Perfumania’s outstanding stock and 11 percent of Parlux’s outstanding stock. The Nussdorf siblings—Glenn, Stephen, and Arlene—have loomed large in past chapters of the Parlux story. FN readers will also want to know how the Rene Garcia family trusts make out in this deal. Meanwhile, sharks scent blood in the water. Stopped watch is right twice a day? Or vision of a Christmas foretold?